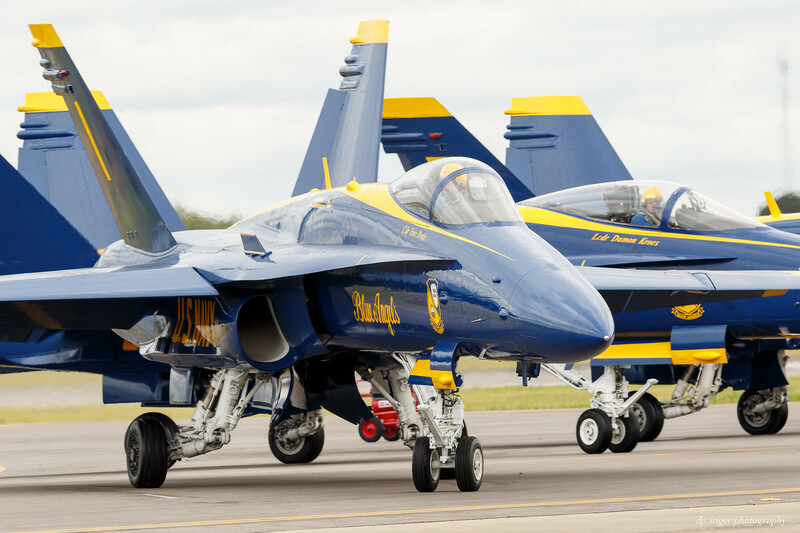 The Blue Angels were originally formed as the Flight Exhibition Team in March 1946 at Naval Air Station Jacksonville, Florida (NAS JAX) by Chief of Naval Operations, Admiral Chester Nimitz, in an effort to raise awareness of naval aviation and boost morale. The team performed their first flight demonstration on June 15, 1946 in Grumman F6F-5 Hellcat aircraft. The squadron was officially redesignated as the United States Navy Flight Demonstration Squadron in December 1974. Lieutenant Commander Roy Marlin "Butch" Voris, a World War II fighter ace, was named Officer-in-Charge and Flight Leader for the newly formed flight demonstration team. Voris selected other WWII veterans into the team and they spent countless hours in early 1946 developing their airshow maneuvers. The group perfected its initial maneuvers in secret over the Florida Everglades so that, in Voris' words, "if anything happened, just the alligators would know". The team's first demonstration took place before Navy officials on May 10, 1946 and was met with enthusiastic approval. The team's 1946 demonstration thrilled spectators with low-flying maneuvers performed in tight formations, and (according to Voris) by "keeping something in front of the crowds at all times." 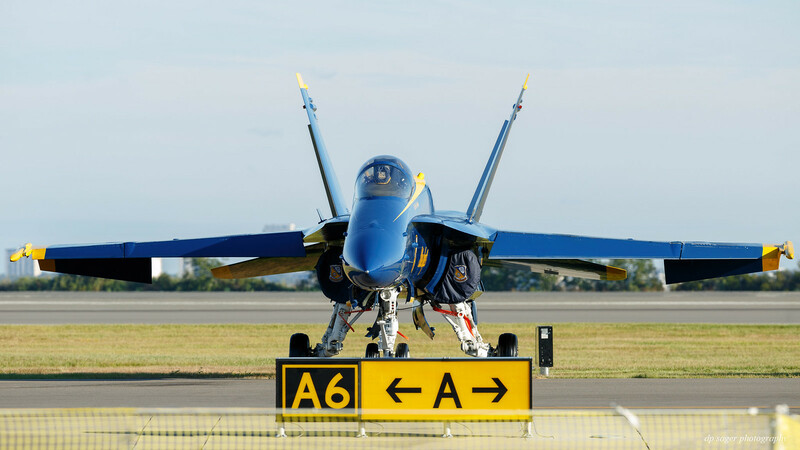 Blue Angel pilots serve two to three years, and position assignments are made according to team needs, pilot experience levels, and career considerations for members. After serving with the squadron, both officers and enlisted personnel return to fleet assignments. The team leader (#1) is the Commanding Officer and is always a Navy Commander, who may be promoted to Captain mid-tour if approved for Captain by the selection board. Pilots of numbers 2-7 are Navy Lieutenants or Lieutenant Commanders, or Marine Corps Captains or Majors. The number 7 pilot narrates for a year, and then typically flies Opposing and then Lead Solo the following two years, respectively. 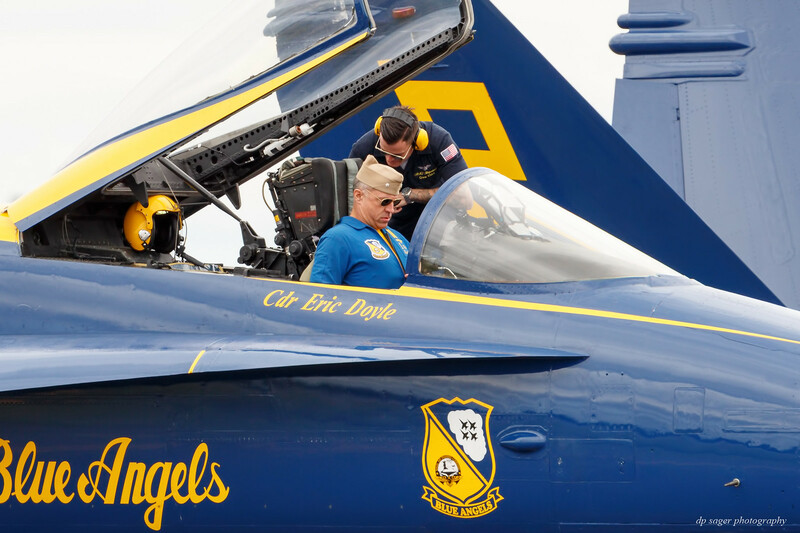 Commander Eric C. Doyle, Blue Angels No. 1, has been a commissioned officer in the U.S. Navy since 1996. He was designated a Naval Aviator in 1999 and made two deployments aboard the USS Abraham Lincoln. He was selected to attend the Navy Fighter Weapons School (TOPGUN) in 2003 and remained as a staff instructor. Following TOPGUN he served aboard the USS Harry S. Truman in support of Operation Iraqi Freedom and later aboard the USS Carl Vinson in support of Operation Inherent Resolve. 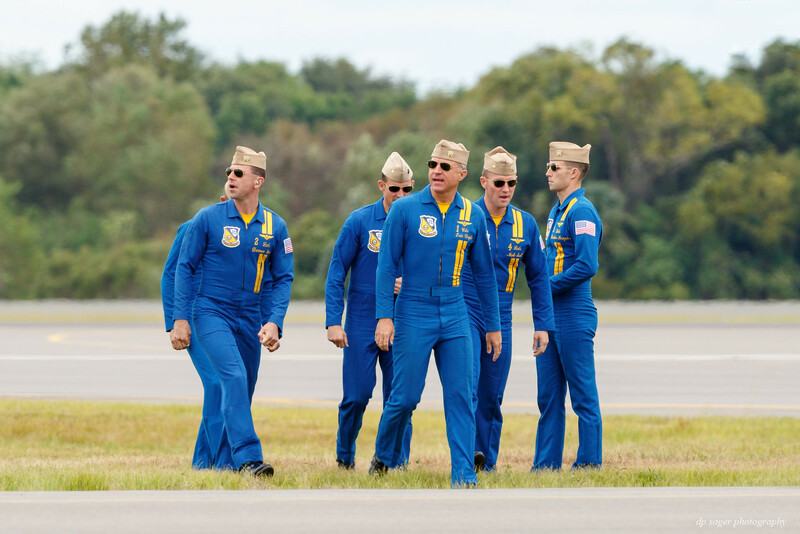 Cmdr Doyle joined the Blue Angels in September 2017 having accumulated more than 3,000 flight hours and more than 600 carrier-arrested landings. All team members, both officer and enlisted, come from the ranks of regular U.S. Navy and U.S. Marine Corps units. The demonstration pilots and narrator are made up of Navy and USMC Naval Aviators. In the U.S. Navy, most Naval Aviators are unrestricted line officers (URL), eligible for command at sea. The team flies fighter aircraft which have formerly served in the fleet and are maintained to nearly combat-ready status. Modifications to each aircraft include removal of the weapons and replacement with the tank that contains smoke-oil used in demonstrations, and outfitting with the control stick spring system for more precise aircraft control input. The team has flown the Boeing F/A-18 Hornet since 1986. The first airshow at the Naval Air Station Jacksonville (NAS JAX) occurred in the 1930s when the station was under control of the Florida National Guard. The first U.S. Navy airshow occurred on October 15, 1945 when the base opened to the citizens of Jacksonville to display the aircraft that had won WWII. 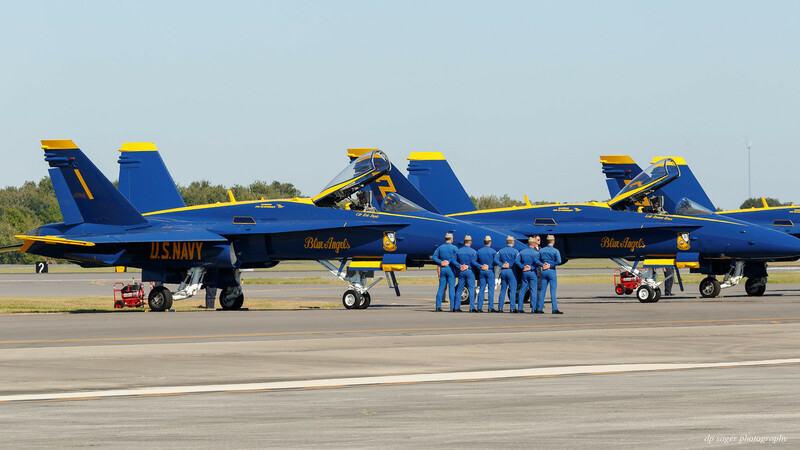 This was the only show at NAS Jacksonville where the U.S. Navy Blue Angels did not perform as they has not yet been formed. Nice article, Semper Fi. I am a former Marine and was assigned to a Marine Attack squadron, VMA 233. We flew A 4B’s. 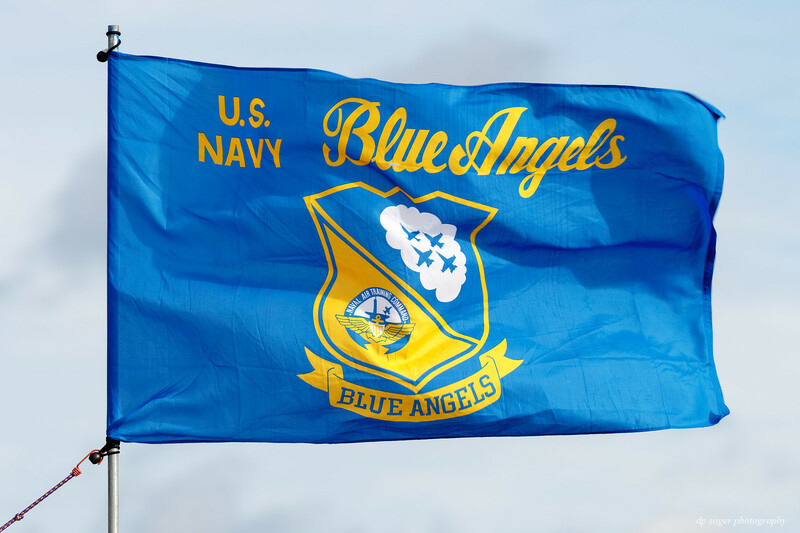 The Blue Angles flew the A4C’s for several years. Really nice! They do put on a show and you got some nice captures. Waiting anxiously for Part 2. 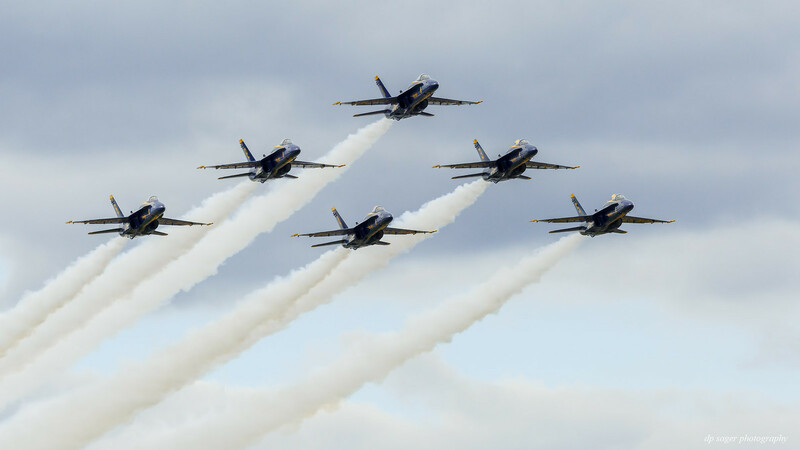 Great info on the Blue Angels history. Thanks. Really nice narrative and excellent images Paul. May I ask how you got what seems like a front row views. I ask because the Blue Angels are to appear here June 8 & 9. Returning after 3 years absence due to BA#6 crashing during a practice run. I would like to get great shots like these. 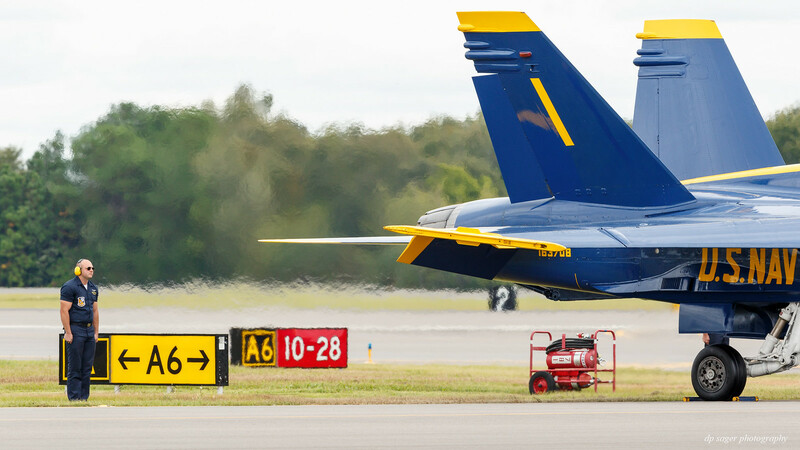 Normally the crowds are so huge at Blue Angel shows, it's nearly impossible to get to the front of the crowd. Perhaps one can with a special ticket or pass. My wife and I have been to the current home of the Blue Angels which is at the Naval Airbase at Pensacola FL. The Airbase is also home for the National Naval Air Museum. Lots of Naval aircraft and history there. We saw them practicing over the area just about everyday while we were there. The highlight was a low (smoke on) highspeed pass (east to west) along Pensacola Beach Florida. What a thrill that was. Again...excellent job on your photography. ... thank you for the outstanding post ... I really miss the yearly Blue Angel visits to the now closed Marine Corps Air Station at El Toro CA that is very near my house... practices frequently had planes flying directly over the house! Great narrative and wonderful photos, Paul. Nice job. Loved the photos and loved the history. Thank you AL13! Glad to bring back the memories. In researching the histories of the US Navy, USMC and the Blue Angels, I ended up with way more historical background content than fit with the images used in the posts. I did become interested in the 8-older types of planes the Blues have used in years past. I really like the shape of the F18s, but your comment has me wondering about the look of the Skyhawk in their many formations. Glad you enjoyed. Hey James, thank you! Regarding the images, they range from 135mm to 600mm, before processing and cropping. The entrance to Jacksonville was free, but you could purchase $10 festival seating after getting through security. I was in line for the airshow security checkpoint both mornings about 45-minutes before the opening and was probably 50th in line even that early. From other airshows with seating, I've learned to pay attention to the wind direction and obstacles like speaker stands, so I was as far upwind as possible, selecting a seat at the end of a row in the second row of the seating area. The third image with the pilots from the rear is 189mm and uncropped, full-frame, so that should give a sense of the distance from my location to show center. In Chicago the Blue Angels and all the airshow performers fly-in from an airport in northern Indiana 30-miles away, so there's none of the pomp and circumstance as was on display at Jacksonville. At both Cleveland, Ohio and Jacksonville, the planes are parked on the runway similar to the first image where the audience is this close to the planes prior to the show at 300mm. The part II post will be all in-flight. The way the team flies close and over the crowd, a 70-300 / 100-400 lens is a great choice for groundshots and every maneuver except the high ceiling shots. I checked the website for the Great Tennessee Air Show where it looks like their premium seating is similar to Cleveland's. I've been to Cleveland in seats now twice, both near the center and the far left and right of center. The center seats give great opportunity for the center-stage crossing shots of opposing aircraft as well as being the target for parachutes. The far left and right give better take-off and landings and well as avoiding blockage by the smoke, depending on the strength and direction of the wind. I try for a seat at the end of a row on the barrier side so I can push away from the only seat next to me and I'm not blocking / bumping people. And of course we can't control the weather. Jacksonville on Saturday started cool and partly cloudy where the clouds came and went but mostly got thicker over the course of the day. Sunday was clear and cloudless and the images are sundrenched rather than the difficult overcast WB of these images mostly from Saturday.